Photo: J.A. Kay, Southport, The Book of The Cat (1903) by Frances Simpson. Image courtesy of The Harrison Weir Collection. 'Champion Birkdale Ruffie' stands tall as one of the most memorable of early Brown Tabbies. And when you consider that he was born in 1890, his overall type was comparable to, if not better than, some of the best solid colours appearing on the show bench. But in general, the indifference with which the Brown Tabby was treated by the show world, deliberately left it languishing in the background, and proved to be an unmistakable stumbling block to its ongoing development. Nowhere was this more obvious than in the provision of show classes, where, although Silver Tabbies had a class of their own, their cousins, the Brown Tabbies were relegated to a joint class, for 'Brown or Grey Tabbies'! But things were about to change, and did, and 'Ruffie' was eventually exhibited again in 1894, generously gaining the recognition and accolades that he so truly deserved. Further grand successes followed, including a memorable win at the Crystal Palace Show of 1896. It was also in 1894, that another English Brown Tabby was born, who would have a remarkable impact on the emerging cat fancy in the United States. This was 'King Humbert', bred by Mr. A.A. Clarke, and imported into the USA by Mrs. E. Nell Barker. He made his American show debut at the Newburgh Show in 1895, followed by an appearance at the second Madison Square Garden Show in New York, in 1896. 'Ruffie' was born on the 22nd March, 1890; (NCC:1778)2, bred by Mr. J. W. Townsend of Lancaster Rd, Wimbledon. His sire is given as 'Climax'(NCC:1034)2, also bred by Mr. Townsend. 'Climax' is described as a Silver Grey, and was a known son of the famous Silver Tabby, Mrs. Anderson Leake's 'Ch. Topso of Dingley'. He is also described in another entry as a full brother to 'Ch. Felix' (NCC:1045)2. The dam of 'Ruffie' was 'Nourmahal' (NCC:1016)2, who is described as a Silver, with black markings. Her parents were 'Tilgath Pileser' and 'Soupeya Sat', believed by many to have also been the parents of 'Ch. Topso of Dingley'. What is patently obvious here is that the lovely warm sable colouring comes from the fact that he was a Tabby, bred from out of two Silvers with the genetic make-up of 'Ii' (or in lay terms, Silver carrying 'non-silver' aka 'non-inhibtor'); hence his warm colouration, plus his well-defined markings. If 'Nourmahal' and 'Topso' were siblings, then this close line-breeding may also account for his superior head type. 'Ruffie' was purchased as a kitten by Miss Emily Southam, and shown without success in 1891, much to the chagrin of his devoted mistress. However, the day finally came when she took him out again in 1894, to the West of England Cat Show, where he forged his first real success under judge Mr. Fred Gresham. Here at last, his beautiful sable colouring, dense markings and distinctive face were seen and appreciated for their worth. On this occasion he won two first prizes in the open and novice classes and two specials. He was also shown at the Crystal Palace in 1896, where he swept the board, taking first prize, championship and several specials, including a special given by the King (then Prince of Wales) for the best rough-coated cat in the show, the prize being a handsomely framed portrait of the King with his autograph attached. In 1897 he was shown again with great success at The Crystal Palace, winning first prize, championship and special. Miss Emily Southey's 'Birkdale' cattery, the home of 'Champion Birkdale Ruffie'. "This was the occasion of 'Birkdale Ruffie's' last appearance before the public, as it was during the following month my sister was taken dangerously ill, and for this reason his pen at the Brighton show was empty. After her death we determined to subject him no more to the trials and discomforts of the show pen, so 'Ruffie' who was now seven years old and a great pet, both for his own sake and that of his mistress, only too gladly retired into the privacy of home life, spending the cold winters by the fireside, in his own little snug retreat, and in the long summer days lying under his bower of shady hops, lazily watching his facsimile, his little son 'Master Ruffie,' growing up more beautiful each day and ready to take up the thread of his father's famous career in the exhibition world. 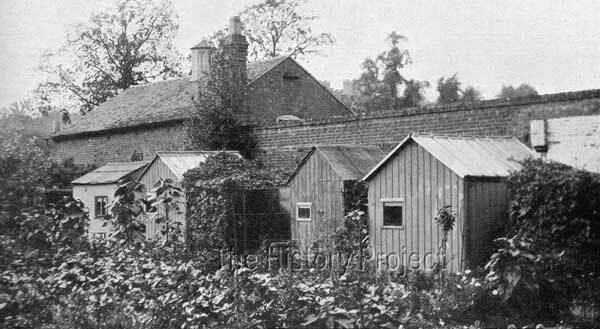 "Our cattery is built on the principle of shepherds' huts, each house having a separate wire run, with shrubs planted, and a thick wall of ivy in the background, which gives a picturesque appearance to the whole of the little colony. In summer a mass of luxuriant hops makes a welcome shade from the hot sun. Although there are no known full siblings to 'Birkdale Ruffie' there are a small number of sire and dam siblings. Most of his sire siblings appear to have been born around March 1890. The first of particular note is 'SILVER RUFF',(NCC:1567)2, a smoke female born 13th March, 1890; bred by Mrs. Vallance out of her precious 'Chinnie', (the dam of 'Beauty of Bridgeyate'- the dam of 'Ch. Silver Lambkin') and the mother of the Chinchilla variety! With the sire being 'Climax' this combines the blood of 'Chinnie' with the lines of 'Topso of Dingley'. Similar configurations may be discovered in a number of other foundation chinchilla bloodlines. 'Silver Ruff' appears to have been sold initially to Miss Molony, later being transferred to Miss Hester Cochran. Also born in March 1890, is 'LORD RUFUS', (NCC:1168)2, a Red Tabby male owned by Mr. Charles H. Lane. The name of the breeder is not given, but the sire and dam are listed as 'Climax' and 'Dolly' respectively. We must therefore presume that the orange or red colouration was inherited from his dam, for whom there are no further details. A third sire sibling is 'DAINTY' the dam of 'Master Ruffie' who is found only in that cats registration, (NCC:3168). So the only information we have on 'Dainty' is that she was by 'Climax' but out of 'Birkdale Patty'(NCC:1793)2. Given that she is out of a Birkdale female and the dam of a cat bred by Miss E.Southam, 'Dainty' should probably be more correctly named 'Birkdale Dainty'. 'Patty' was registered as a Blue Tabby and as she was born in 1894, that means that 'Dainty' cannot have been born until at least 1895. There is only one dam sibling of record, but she is from a significant combination. The dam of 'Ruffie' was 'Nourmahal'(NCC:1016)² and in late 1891, she was bred to 'Ch. 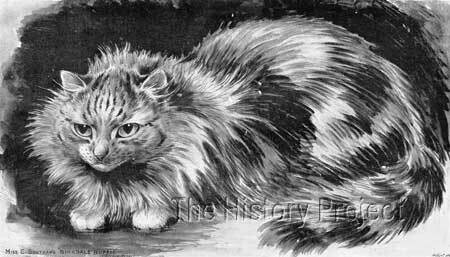 Silver Lambkin', producing the silver tabby female 'BROOKVILLE FLUFFY' (aka 'Fluffie) ,on 20th February, 1892. Her breeder is given as Mrs. Smyth, suggesting that her dam has changed from the ownership of Mr. J.W. Townsend to Mrs. Smyth since the birth of 'Birkdale Ruffie'. 'Brookville Fluffy'(or 'Fluffie') was owned by Mrs. Edward Robinson. 2nd, Crystal Palace, 1890; 3rd, Crystal Palace, 1891; 2nd, Keswick, 1894; 2nd, Blackpool, 1894; 2nd, Southport, 1894; 1st Open, 1st Novice, and two Specials, West of England,1894, (Judged by Fred Gresham); 1st, Championship, and multiple Specials, Crystal Palace 1896, (Judged by Mrs. Vallance); 1st, Championship and Special, Crystal Palace, 1897. Despite the fact that 'Ch. Birkdale Ruffie' was a much admired stud of obvious quality who lived a relatively comfortable life in the Birkdale cattery environment, we can only find a relatively small number of progeny. 'Miss Whitney's 'Brayfort Princess', a grand-daughter of 'Ch. Birkdale Ruffie'. Three of these appear to have all come from one particular combination, when 'Ruffie' was mated with the tabby female 'Birkdale Priscilla'(NCC:1774)2. 'Priscilla' is listed as a Dark Tabby female, born in 1887 from unknown parentage; bred by Mrs. Kinchant, and owned by Miss E. Southam. For two of the three cats which resulted from this mating, we have dates of birth, the third is unknown. The earliest with a known date of birth was 'GREVILLE CHIPONAP',(NCC:1922)2, born 16th May, 1893 and described as a Sable Tabby male, like his sire. He appears to have been sold to Mrs. Pengelley of Greville Place, London. NW. 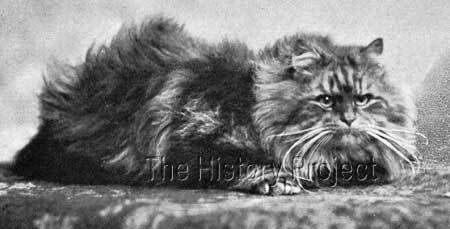 The second was 'BIRKDALE QUEENIE', (NCC:1777)2, a sable tabby female born 26th August, 1894. 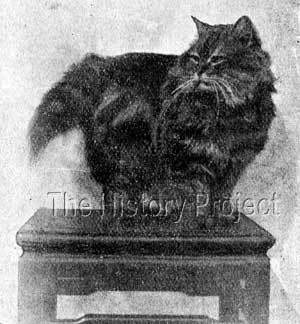 'Queenie' was shown successfully as a kitten at Southport in 1894, winning a first prize and a medal. The third cat from this combination is found in the background of a cat registered in Volume One of the Cat Fanciers' Assocation Stud-Book and Register. His name was 'BLUE TOM' and he appears as the sire of 'Greville Pearl'4. Wild he may have looked, but she obviously was enamoured with him enough to seek out a brown tabby daughter of her own. Miss Whitney's 'Brayfort Fina', a grand-daughter of 'Ch. Birkdale Ruffie'. When 'Birkdale Ruffie' was bred to his half-sister 'Dainty', doubling on his own sire 'Climax', this produced his namesake 'MASTER RUFFIE',(NCC:3168)2 a sable tabby male born 19th May, 1897. 'Master Ruffie' was retained by Miss Southam and was destined to follow in his sire's footsteps. He, in his turn, became the sire of a second generation of sable tabbies, producing Miss Whitney's 'Brayfort Princess' and 'Brayfort Fina'. The dam of both Miss Whitney's sable tabby queens, was 'Bluette', by 'Birkdale Boy' and out of 'Dainty'; so that on paper at least, there was a triple on 'Climax', appearing in three of the eight lines comprising the fourth generation. The only outcross in the entire pedigree comprised of 'Blue Boy the Great' and Miss Jay's 'Holmwood Trixie' who were the sire and dam of the blue Persian male, 'Birkdale Boy'. "Master Ruffie' has only been shown on two occasions - in 1897 as a kitten, and in 1899 at the Crystal Palace, when he returned home with his box literally filled with cards, his winnings including three first prizes, four specials and a Championship. "I am sorry we can manage to get no really good photo of 'Master Ruffie'. Time after time we have attempted it - in studios, out of doors, by means of professionals and amateurs - including many kind relatives and friends with their ever-ready little Kodaks! 'Master Ruffie' steadily refuses to face the camera. Again and again the button is pressed in vain, and only the glimpse of a vanishing tail upon the negative is all we have to show as 'Ruffie's' portrait! Lastly, a daughter of 'Birkdale Ruffie' out of an unnamed queen, was 'MOLLIE', who was owned by Mr. James Whitley of Bingley. From 'Mollie' Mr. Whitley bred a Sable Tabby male named 'Hercules' born 3rd April, 1897, whom he sold to Mrs. Toothill in Leeds. Mrs. Toothill in turn exported 'Hercules' to Mrs. F.J. Sarmiento and Mrs. Dwight Cutler of Arlington Place, Detroit, Michigan. With this sale, his named was changed to 'Arlington Hercules' (BCC:601)5 and he established a considerably respectable name for himself as a major winner. Before leaving England, he won a first and Special at Westminster, following this up in the United States with wins at Cleveland (Ohio) and Chicago in 1902, and at New York, Boston (Mass.) and Rochester in 1903. His awards included the Atlantic Challenge Cup, and medals and specials too numerous to mention. A Caricature of Miss Southam's 'Birkdale Ruffie' by Louis Wain. Today, we can see, photograph and share beautiful things, including images of the cats that capture our hearts and/or our imagination, in a matter of seconds, almost instantly uploading them to social media. Although this functionality may appear seamless and be almost instantaneous, in reality, what we share was in itself, not the product of any quick or impulsive decision-making. The cats of today, have been carefully crafted from the genetic package passed to to-day from yesteryear, through the stewardship of generations of hands and unbelievable dedication. Selection takes time, patience and fortitude, and when our eyes are suddenly focused on an image of unbelievable feline beauty, we are truly living 'In the moment'!